T he award is in recognition of Freeman’s time and effort in developing ASTM Standard Designation D7891. 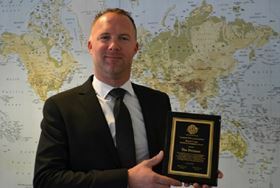 Tim Freeman, managing director of Freeman Technology, has been presented with the ASTM’s Richard S Ladd Standards Development Award. The award is in recognition of his time and effort in developing ASTM Standard Designation D7891: ‘Standard Test Method for Shear Testing of Powders using the Freeman Technology FT4 Powder Rheometer Shear Cell’. ASTM D7891 details the apparatus and procedures used to evaluate the incipient failure properties of a powder under consolidation, including the determination of cohesion, unconfined yield strength and flow function. This story uses material from Freeman Technology, with editorial changes made by Materials Today. The views expressed in this article do not necessarily represent those of Elsevier. Tyler Olson, engineering manager at Fastenal Company, has been awarded the 2018 ASTM president’s leadership award.